Staff members who provide home visits to vulnerable families face many opportunities and challenges in addressing smoking. Families may be dealing with multiple serious concerns such as housing, poverty and abuse and smoking may not be their current priority. Raising the issue of smoking too early or in an inappropriate manner may interrupt the process of engaging the client in a trusting relationship, the foundation to working on a range of needed psycho-social issues. This resource is designed for service providers who may have an opportunity to discuss smoking with women and/or their family members during home visits. 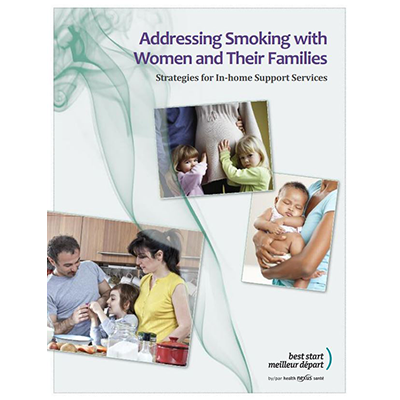 While engaging directly with clients, this resource suggests ways that service providers can assist and motivate women and their families to think about their smoking and consider trying to quit smoking. It introduces the concepts of behaviour change, outlines types of interventions, discusses available smoking cessation aids, provides evidence-based information about the process of quitting, and includes tips for service providers to guide smoking cessation interventions. Knowledge regarding evidence-based information on risk factors for, and the consequences of smoking before conception, during pregnancy, in the postnatal period, as well as the effects of smoking on young children. Understanding of effective approaches and useful tips for addressing smoking and offering smoking cessation supports to families in their home. Awareness of pertinent resources, programs and references to assist service providers in addressing these issues and obtaining further information. Awareness of available resources for clients and their families.